We’ve had a busy but productive day. Bill was well enough to go to school this morning thank goodness so off Beth and I went on one of our mammoth travelling Thursdays. After dropping the 2 littlies off at school we headed off to Frankston to see Flaxseed Guy. Beth was in fine form this morning, asking all sorts of questions and answering them too. Mainly about various movies which seems to be her preferred topic of communication. 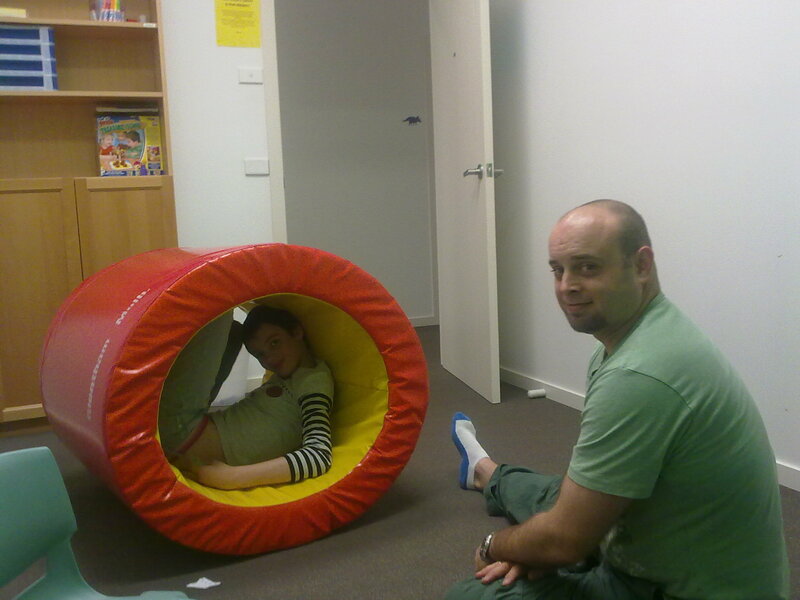 Richard was talking to somebody so the naturopath – Alan stayed in the room with us while we waited. Beth and him got into chats about which movies they had seen and this continued on when Richard came back in. They were quite impressed as she doesn’t often talk to them, especially not at length. She also pulled out of her repertoir her catchphrases such as “that’s dithpicable” from Daffy Duck and “doh” from Homer Simpson much to their amusement. Pauline who works on reception also commented on the fact that Beth had said quite clearly “Hello Pauline”, something that she hadn’t done before. The numbers that are meant to be going down with the flaxseed oil seem to be. Last time we went they were at 80, now they are at 14. Between 1 and 10 is a good number, meaning that no damage has been done to the brain. I told them about Beth’s moods lately and sleeplessness so Richard suggested that we checked her liver again in different areas as this can cause sleep issues and moodswings. I said that I thought that it was just the fact that she had hit puberty. (I’ve ordered a book from my friend Kerry who sells learning ladder. It’s called Princess Bitchface Syndrome, all about girls and puberty. Let me know if anybody would like the book and I’ll pass on her number.) They did the testing and to my relief found nothing. This did give me even more faith in Richard as he could have suggested further treatment and I would have accepted that. He said to do what we have been doing for 4 more weeks, after that the number should have gone down sufficiently and then we should be finished. I asked him to do a report for me so that I can take it to the DAN (defeat autism now) practitioner so we don’t double up on assessments. He’s the allergist so I’m raring to get that one started. I’m so pleased we’ve seen it through with Richard as I have seen improvements in Beth’s communication. I wonder if how good she seemed this morning also had something to do with the fact that she had a good night’s sleep? We popped in to visit my friend Lesley who lives just around the corner from there, then headed off to Sensational Kids. Melinda the OT has left and is not being replaced for another 2 weeks. We still went to see Rod though. It was a good session today. Rod had the pictured soft tube, I suppose you would call it and Beth was inside it for most of the session. She had Rod holding her in it upright to start with and then ended up on the floor, asking Rod to pick it up and swing it around. He told her that he wasn’t strong enough so they got into a game where she would suggest a big animal to lift her up. Rod would then talk to the animal and ask them but they always wanted Beth to do something first. She had her Little Angel magazine so the elephant for example asked her why she liked reading it. She said it was because it was cool. The elephant didn’t understand what cool was so Beth explained that it made her happy to read it because it was awesome. This satisfied the elephant so she got a ride. She had to speak dinasaur as Rod didn’t speak dinasour but he had to speak Gladiator because Beth didn’t know how. It was a good fun game and Beth was really engaged as she was getting the physical stimulation to keep her ‘up.’ At the end Beth had to tell me the story of how she got so many rides in the tubey thing which she was pretty good at, though she forgot about the dinasaur speak. Rod is trying to get her to understand things without us giving her direct answers. When he was helping her with the story he would gesture to things or make movements rather than just telling her the words to use, therefore she had to use her own thought to tell the story. All in all I was more than happy with today’s results. Beth went to asleep at 10pm last night, if not before. As you know I had been to the chemist on Tuesday and had gotten some Melatonin chewable tablets. Kevin the Chemist had said that adults take 3 – 5 a night so we would be safe giving Beth 2 – 3 as she is the size of a young woman now. Tuesday night we tried 2. I had given them to her about 7.30 as the suggestion is to give them 3o minutes before bedtime. I went to sleep after 10 and she was still awake then. I called Paul at work in the morning to ask what time she went to sleep but he had fallen asleep on the couch! She had been fairly calm though. Last night I gave Beth 3 of the tablets. She went off to bed ok and even turned the light off early so I thought woohoo, here we go! Then she was up and down for the toilet and a drink a couple of times. In between those times however she was quiet so I thought at the very least that it had calmed her ‘restless legs’ and allowed her to rest easier. I heard the light go on again at 9.30 so went in to turn it off. I told her that because we had Richard Malter today and Sensational Kids that I wanted to give her a good night’s sleep. That was the last of it! When I went in to check at 10 she was asleep. Beth has the ability to wake herself up and fight any attempts to help her sleep. I think if I had let her continue reading she would have gone to sleep later but it’s like she knows that she’s drifting off and fights it. When younger I would give her a massage to help her calm down. The first night I did this she was off like a light really quickly. The only time. Eventually the little bugger had me massaging frantically for up to 1/2 an hour and then still going to sleep really late! I’m always scared that she’ll pass the tired phase. I remember going to the Lasers Disco as a teen and getting to about 1 or 2am and being exhausted. If I went home then I’d crash, but if I stayed another hour and then went home my head would be spinning and I’d lay there wide awake. That’s how I think Beth is, she fights to stay awake and then has a real problem when she gets past it. Only time will tell. Hopefully we’ll have good responses today because she’s slept so well. Will keep you posted. I went to the doctors today with poor old Billy who has an ear infection. We were up all night as it popped last night and he was in agony. I had an appointment to discuss things about Beth with Mark but we changed it to taking Bill instead. Mark was very good though and was ok about me talking about Beth too. I had put on facebook that Beth has been having problems getting to sleep and several people (thanks guys) suggested that I tried Melatonin. As Beth is on Lovan (anti anxiety) and Singulair (asthma preventer) I was unsure of whether melatonin would react with these. Mark assured me that it would be ok though he had reservations as to whether there in fact was any validity to the claim that it helps people sleep. I said that I didn’t care about whether it may or may not, as long as it didn’t hurt Beth I would try anything. We took Beth to England with us on a family holiday when she was 18 months. Crazy I know but we didn’t know then what we know now. She was actually quite well behaved. She wasn’t walking yet but was so big already, it was odd to see this great big girl crawling around. On the way we decided to try the old trick of Phenergan which is meant to make kids sleep for several hours. I love going on planes. I love everything about them, from the fact that you have nothing to do but read or watch tv or play games, to the hot flannels they give you after a meal. I even love the food, though I love hospital food too! I think it’s the fact that you just get your meals brought to you without doing anything and you never know what it’ll be. Going on a plane with an 18 month old, to England of all places, is a different matter. We decided to try the sedation alternative but unfortunately for us Beth was in the minority of kids who actually get really hyper instead of sleepy! Now that was fun! Of course at that age they’re hard to entertain. Nowadays my kids would play their ds’s or on the computers on the plane but not only were those things not invented then, she would have been too young for them. We’re trying the melatonin out tonight for the first time. I can only hope that Kevin the Chemist was right, that it wont have the same effect! Fingers crossed. I had a very up and down week last week. I’ve been really stressed about Bridie as her talking to others seems to be getting less and less. The principal is going to involve the school psychologist thank goodness. Beth was all over the shop, up and down out of bed and very very moody and argumentative. Yesterday however we had a really good experience that made it all worthwhile. I’ve been thinking over the last few weeks (after our trees adventure park experience) that Beth really has no enthusiasm for anything other than watching dvds or playing on the computer. She does enjoy swimming but doesn’t put a lot of effort into it. She didn’t really enjoy horseriding, didn’t bother when she did piano lessons, anything that basically requires effort she just doesn’t seem fussed about. Mind you when we had a hags party at the Knox Gym one school holidays she enjoyed that as they have a huge trampoline to bounce on. And as you know, her level of participation at the trees adventures was zero, not interested, just not going there. End of story. I didn’t tell Beth yesterday that the choir we were going to was to be for autistic kids, I just told her it was a new type of choir we were trying out. Of course she didn’t want to go and whinged the whole time. Most of you would have heard of Donna Williams or read about her on here. She is an adult with autism and has written many books about her experiences. She’s also a fabulous artist and singer songwriter, a real inspiration. She decided to start a choir for the kids on the spectrum with the help of some of her band members from The Aspinauts. Donna welcomed us at the gate and Beth zoomed in for the trampoline. Donna tried to suggest that we could sing first and trampoline second but Beth was having none of that. The choir was to be in a little cottage down the garden. All in all there were 4 kids, all of a fairly similar age which was nice. Beth decided that she wouldn’t participate to start with and I thought we were in for a bad time but Donna and Anthony were amazing with her and the others, engaging them like nobody else could. Anthony was on the keyboards and let Beth and another girl have a go. Then Donna suggested that we just sing our favourite word. Ben’s favourite word was Aquarius so they sang that in scale. When it came to Beth’s turn she made up a word like Boombabaloomba and they laughed and said what a great word that was, singing along with it. Of course once Beth realised she had an audience she kept interrupting with something else she thought would be funny, not giving anybody else a chance to get a word in. They then sang some simple choruses. One song that Donna had written was all about snot which of course the kids loved. Beth then sang a love song from High School Musical and the theme song from Pinky and the Brain! Nothing fazed Donna and Anthony who just made up the music to go along with them. One of the girls, Kayla loved to boot scoot as she sang so they were all dancing along and jumping in the air which is Beth’s speciality. It was so nice to see everybody doing ‘a Beth’ and not having a care in the world, Beth had a grin from ear to ear, as did I watching it. Sometimes I think I am doing her a disservice by wanting her to go to an autistic high school but at other times such as this I think about how comfortable she is with others like her, how easy it is. Or maybe it’s how easy it is for me to watch her in that environment, not cringeing as I see the other kids faces as they watch her. At the end of the session Donna wrote down a song from each of the kids that they liked and promised to learn them by the next time we see them. Beth chose High School Musical, Ben chose Tonight’s Gonna be a Good Night, Kayla and Tilly chose Dancing Queen. They ended with a dancing train around the garden paths. When it was time to leave Beth kept asking them to sing another song. Donna suggested that maybe they could teach Beth the keyboards which I jumped at. She did try in grade 1 at school but wasn’t really interested. Maybe if she’s taught by somebody that ‘gets her’ it might make all the difference.